I am organising my first Photography Party and you are invited! 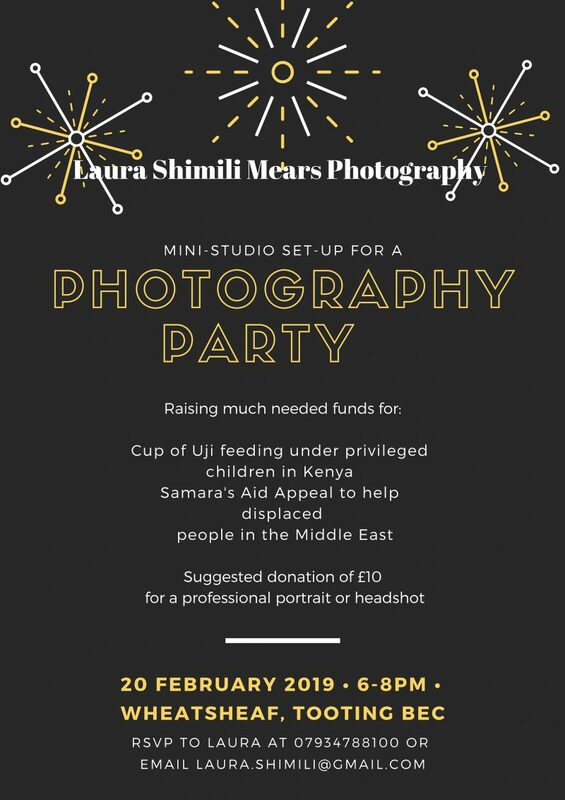 I am very excited about the Photography Party, at the Wheatsheaf in Tooting Bec I am organising on the 20th February, 6pm-8pm. I will offer to take a portrait or a headshot for the suggested contribution of £10 on the day for 2 great causes. Please do join me as I set to raise funds for 2 charities: a cup of Uji who provide underprivileged children in Kenya with a daily cup of porridge and Samara’s Aid Appeal who help displaced people in the Middle East. A great opportunity to socialise but also produce something useful for you to take away, a portrait or a headshot. To RSVP email me with “Photography Party” on the subject line so that I have an idea of numbers. Call/text 07934788100 or email photography@shimilimears.com or go to Contact me page. You can also donate online through my shop following this link Photography Party at the Wheatsheaf, Tooting Bec. The fund for all the items sold will go to these 2 charities. Why “A Cup of Uji”? I have discovered “A cup of Uji” recently and the man behind the campaign, the 26 year old Francis Otieno Amonde. I have followed his activity on social media after a couple of initial donations, and I have seen the amount of effort, energy and motivation he puts into his mission to help the children he works with. I have exchanged emails with him asking for more information about what he does. He helps underprivileged children in Kenya to go and stay in school through a feeding programme, “A cup of Uji (drinking porridge)” to children in disadvantaged areas including slums and community and public schools. Read more below. I contacted her to let her know about my event and she was very grateful and said that the current appeal she’s looking for support with is a SQUARE METER APPEAL which will help the building of GRACE HOSPITAL in Syria. At the moment they are raising funds to cover the master planning and concept design. Well because I feel strongly about helping other people and creating opportunities for people who go through a very difficult time in their lives and come out of it stronger. In particular since being a mum, seeing hungry, scared and displaced children makes me teary and I want to do something about it. Having started my own photography business recently I want it to be a business for good that helps other people. In 2017, the United Nations released a report noting that nearly 800,000 children are malnourished in Kenya, many of them affected by drought. Francis Otieno Amonde set up “A cup of Uji” campaign for his Community Based Organisation, Hope Alive Campaign to raise funds and awareness for his cause. He started with his own money but as his work grew, friends started chipping in for the good cause. An estimate of 1500 children are benefiting from the program. The resources to run the feeding program come through donations in the form of money or Familia porridge flour and sugar. Francis is very keen on accountability and always shares the purchase receipts and updates with his donors who he reaches out to through social media and one on one interactions. Aside from the feeding program, Hope Alive Campaign donates sanitary towels to girls in school. The towels are ordered from the Zana Africa Foundation and benefit 143 girls. They are also keen on providing mentorship for boys because they need to feel valued, understood and empowered. It is commendable that Hope Alive has been able to sponsor students to school by providing school fees and shopping. There are so many challenges that African children face but getting an education is one of the most valuable gifts they can receive. This initiative started in August 2014 with an email to the mothers in Samara’s son’s year group, in Brighton appealing for winter clothes and shoes to send to the people displaced in Iraq who lost everything when IS took their towns, cities and villages. It has quickly grown into a large humanitarian aid project. In February 2018 they have sent more than 94 consignments (artic lorries, containers and ambulances) carrying clothes, shoes, bedding, toiletries/hygiene items, essential medical equipment, ambulances and school equipment. They have also opened two not for profit hospitals in Syria and are planning to open a new 7,000m2 hospital providing essential medical services for civilians in the East or Syria. They also have a vision to design and build a new hospital with a focus on critical care. If you would like to get involved please come along to this event, the first one I’m doing. I’ll be doing more of them and regularly so watch this space. And generally if you want to have a chat about how to help other people, I am always up for that.